hej Välkommen till Kennel Little Rosebud's hemsida! Azzuro our beautiful and charming white old boy. After winning Norwegian Veteran Winner and ending up as second best male for Mr Göran Åkesson a breedspecialist and also winning Nordic Veteran Winner the next day in November 2014 in Lilleström. 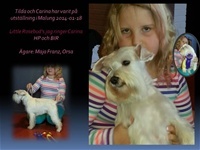 He entered the ring in Stockholm December 13 at Stockholm hundmässa for breedspecialist Miss Nina Karlsdotter. 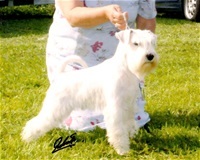 27 White miniature schnauzers were entered to this show. Azzuro went all the way to Best of Breed! What a day. Swedish Veteran Winner 2014 and Swedish Winner 2014. And BOB. he has been doing fantastic results through the years. 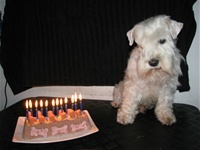 And this years christmascard will bring her more fantastic news on this little white dogs showresults. 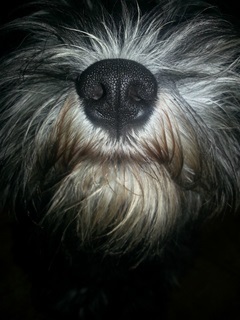 Karlsson 12 years old today! Time flies, it seems not long ago since we picked up this White super special boy from Ingrid and Jennifer in Germany.